1. Poke holes into spaghetti squash and cook in microwave 10-12 minutes. 2. Slice squash in half. Then using a fork, scrape out the inside of the squash and set aside. 3. For sauce, sauté garlic and onion until brown. Then pour in one can crushed tomatoes. Add in parsley, rosemary, and spices. Simmer on low heat 20-30 min. 4. In mixing bowl combine 300g cooked spaghetti squash, 3/4 cup of our red sauce, 2 egg whites, 1oz Mozzarella, 1 T Fat Free Parmesan, and spices. 5. Pour entire squash mixture into a skillet and bake at 400 for 20 minutes. 6. While baking, place ground turnkey in a mixing bowl and add spices. Form 1 by 1 inch turkey meatballs and cook over stove top until lightly browned. 7. 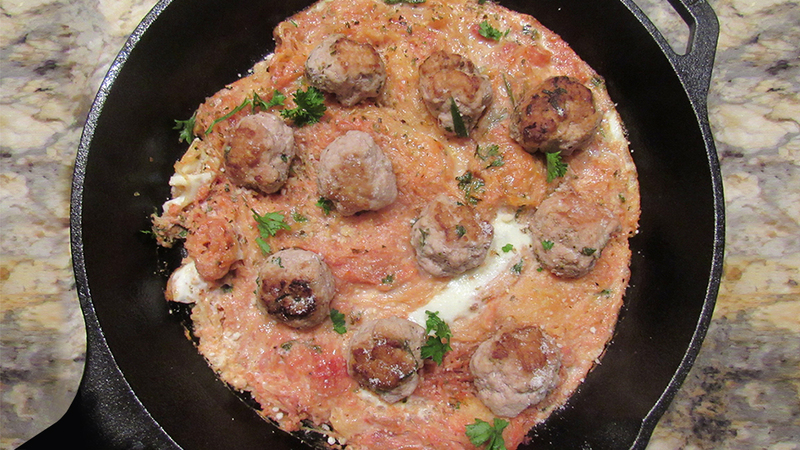 Once skillet is 75% done, remove from oven and top with turkey meatballs, 1/4 cup sauce, and 1 T fat free parmesan Cheese. 8. Place back in oven for the remaining 5 min, then remove and let cool 5 min before serving, enjoy!